I recently read three books. Here’s my recap and maybe one of them will spark your interest! Smoke Gets In Your Eyes: It’s non-fiction, it confronts death head on, speaks to the death industry and changed my life! 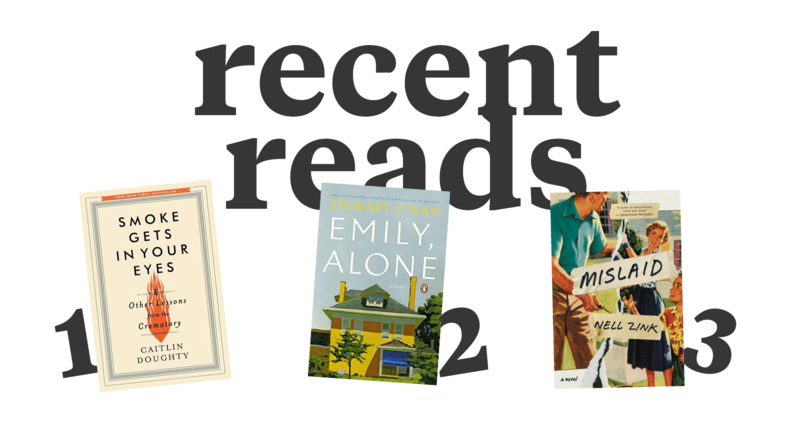 Emily, Alone: A novel (there’s technically a book that comes before this but I didn’t read it) about an elderly woman living alone. Really touched my heart after staying and helping at my grandparents’ place last month. Mislaid: The story of two people who get married + procreate even though they shouldn’t have. The writing, in my opinion, gets better as the book progresses.